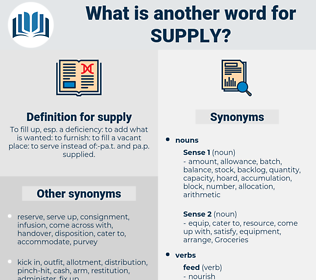 What is another word for supply? To fill up, esp. a deficiency: to add what is wanted: to furnish: to fill a vacant place: to serve instead of:- pa. t. and pa. p. supplied. Sanctuaries, Ships, PROSPECTS, Operators, meals, champions, features, provision, cigarettes, Mains, items, goods, approvisionnement, offers, delivery, Deliveries. supplying, requirements, stores, Provisioning, Sourcing, Supplied, distribution, distributions, availability. supplying, supply-side, Provisioning, Sourcing, Supplied, quantity, rendering, distribution, availability. fail, refuse, withhold, deplete, retain, veto, seize, disapprove, deny, use, use up, keep, waste, take, receive, oppose, take away, hold. My father, though not a millionaire, is wealthy and generous enough to supply all my wants, and the reason I took this position with you is a special and peculiar one, which I will tell you about if you care to hear. I supply to every want and taste.